These egg rolls are better than Chinese takeout and easier than you think. Inside the crunchy wrapper is bursting with Asian flavor and crisp tender vegetables. Cook pork sausage until no longer pink; drain and set aside. Stir fry vegetables, garlic and ginger with sesame oil just until tender. Remove from heat and add pork sausage and soy sauce. In a small bowl, combine water and cornstarch. Mix well. 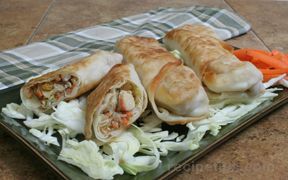 Lay out one egg roll wrap with a corner pointed toward you. 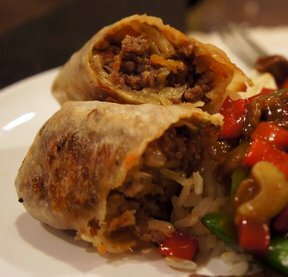 Place about 1/4 cup of filling on egg roll wrap and fold corner up over the mixture. Fold left and right corners toward the center and continue to roll. Brush a bit of cornstarch mixture on the final corner to help seal the egg roll. 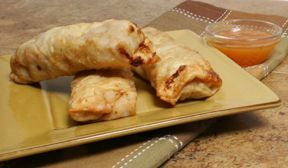 Place egg rolls into heated oil and fry, turning occasionally, until golden brown. Remove from oil and drain on paper towels or rack, then they are ready to enjoy! NOTE: These egg rolls could also be baked in a 450 degree F oven for 20 minutes. Spray with cooking spray before putting in the oven fro a crispy wrapper. "Great flavor on these. I stuffed them pretty full so I only got 8 egg rolls, but they were great. I also baked them instead of frying them just to make them a little healthier. I didn't even need a sauce to dip them in!"